Hi! It’s Julie! I’m here to share a card I created using stamps from the Winterhaven Stamp of Approval Collection. This collection was so fun to play with, and I can come back to it time and time again. On this card, I have used CP's inks in two different ways, but have tried other techniques on other cards, and they are FANTASTIC! If you already have these inks, then you know I’m right. 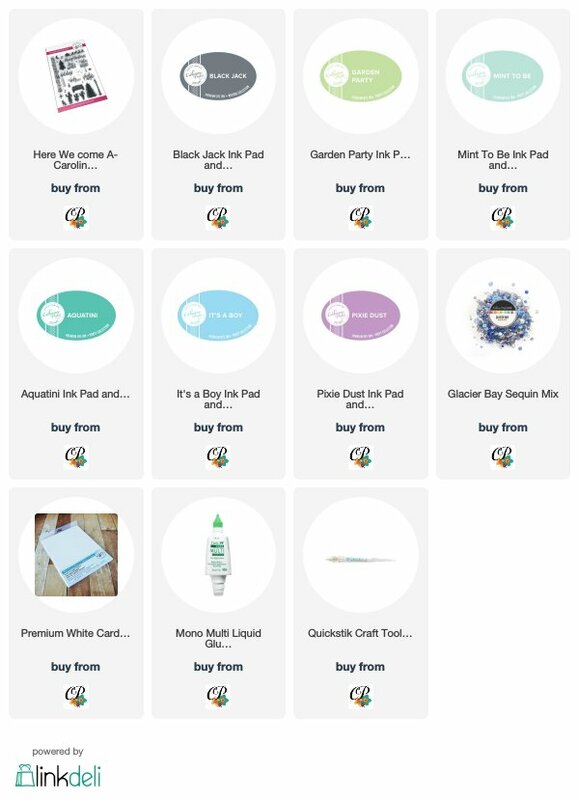 LOL If you do not have these inks, you must get them in your cart, ASAP!! You can thank me later. Today, I’m using just three stamps from the Here We Come A-Caroling Stamp Set, but this set is, from border to border, full of holiday fa-la-la! I started with a card panel that is 4 x 5.25 and picked out my color palette – Aquatini, It’s a Boy, Pixie Dust, Mint to Be and Garden Party. There was some pre-planning ahead of time to make sure I could get 5 tree stamps to fit across the width of this card, and they do – the bottom points line up, and I used a ruler and pencil marks to space them carefully. Starting with Pixie Dust, I stamped the middle tree and then stamped the other four trees in the remaining colors. Now, these graphic trees looked great in these non-traditional Christmas colors, but I decided to sprinkle some water droplets on them to get a subtle watercolor look. After drying them really well with my heat tool, I added the Happy and Holidays sentiments using Black Jack ink. I wanted some snow, so I used Heidi Swapp Shine Spray in White and spritzed it very lightly to get those lovely pearly droplets, and topped it off with five Clear sequins. The front panel was done, and I almost left the card base white, but I thought it would be great fun to have a color to pop the design. 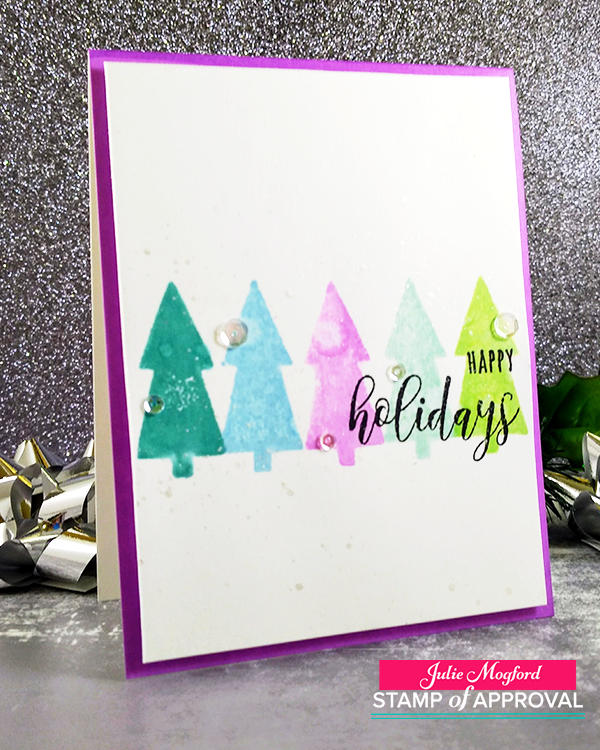 After masking the back of my card base, I used the very pretty Pixie Dust Ink Pad, and swiped it on the edges of the cardstock. Once this was dry, I popped the front panel with some foam tape squares. 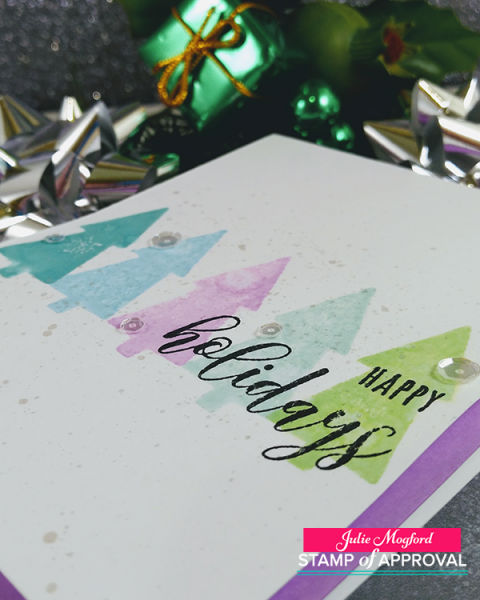 Such a fun and quick card for the holidays, and so easy to replicate, and even modify. Choose some other color combos, with or without the watercolor effect. Change out the trees to the traditional tree, or even try the die cut trees from the Winterhaven Dies, all lined up in a row. How Cute!!! Thank so much Catherine for having me here today. 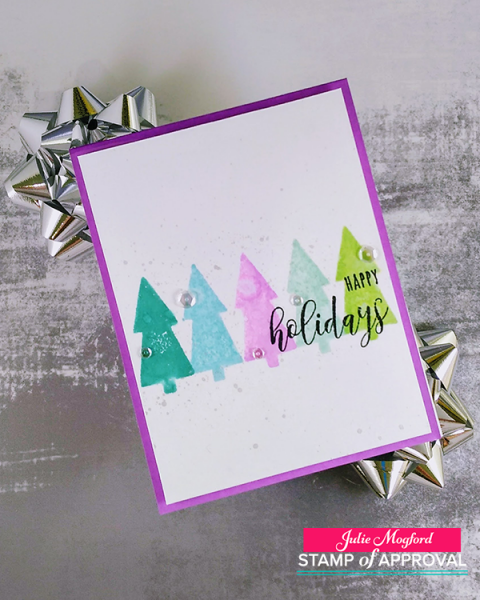 I hope that I have inspired some of your readers to try a non-traditional color scheme on their holiday cards this year.